It’s rare to find yourself watching a lecture you’re convinced will be responsible for someone’s death; it’s rarer still to be watching it in an audience alongside some of the very people you fear are most at risk from the lethal advice on offer. Yet, that’s precisely the situation in which I found myself recently. In August, Liverpool’s Holiday Inn hotel was the setting for “Censored for Curing Cancer”, a talk by American chiropractor and naturopath, Patrick Vickers. Vickers runs the Northern Baja Clinic in the jurisdiction of Mexico’s lax regulations, and slickly marketed to cancer patients around the world for its ability to “cure advanced terminal cancer”. And so it was that 70 people, including a distressingly-high number of cancer sufferers and survivors, heard Vickers extoll the abilities of ‘Advanced Gerson Therapy’ to cure cancer. Among the whole audience, it seemed that only me and my two colleagues, from the Merseyside Skeptics Society, brought anything other than an eye of unquestioning acceptance. It’s hard to put into words just how dangerous Vickers’ unqualified opinions on cancer actually were. He is a follower of Max Gerson, the Polish naturopath who, Vickers claims, had “the most consistent rate of curing advanced terminal cancer to this day”. This is just one of the many points on which Gerson’s modern-day disciples stand in direct opposition to medical science. That’s not to suggest that Gerson’s miracle cure was merely confined to cancer: the Nobel Peace Prize winner Albert Schweizer was apparently convinced that his ‘severely advanced’ diabetes had been cured by Gerson in just 6 weeks (Vickers: “That’s standard. Severely advanced diabetes, 6-8 weeks, maybe 12 in this day and age. Patients are off their drugs and they no longer have diabetes.”). That we have only the word of Gerson and Schweizer on this miracle cure, and the similarly miraculous cure of Schweizer’s wife’s ‘terminal tuberculosis’, perhaps explains why the majority of the medical establishment haven’t yet abandoned evidence-based medicine to become Advanced Gerson acolytes. 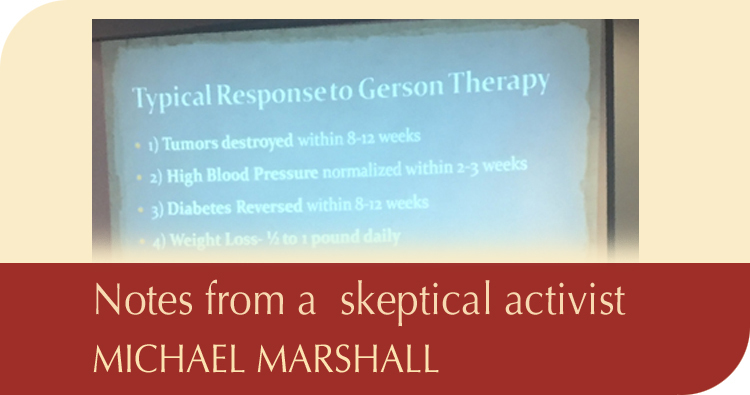 Though long since recognised to have no benefit in the treatment of cancer, Gerson Therapy remains one of the most common pseudomedical treatments for the disease today – a fact which is tragically evidenced by the pilgrimage of patients to clinics like Vickers’ Northern Baja centre in Mexico, and the frequent media reports of fundraising events to help those Gerson patients meet the spiralling costs of their treatment. The therapy itself is based around a gruelling and ultra-restrictive diet, with the patient consuming 20lbs of raw organic vegetables per day, juiced into a thick sludge which is to be drunk on the hour, every hour, from 8am until 8pm. Naturally, this means an extensive stay in an expensive clinic (Vickers’ own establishment charges nearly $18,000 for the three-week stay most patients ‘require’) in order to learn how to prepare so meticulous a diet. If the constant juicing (and inevitably subsequent bathroom adjacency) weren’t inconvenient enough, patients are expected to endure a minimum of five coffee enemas every day, along with a regime of supplement pills administered in doses that border on the downright dangerous. As Vickers boasted during his presentation: “If a medical doctor learned how much potassium we give patients every day, they’d be frantic”. 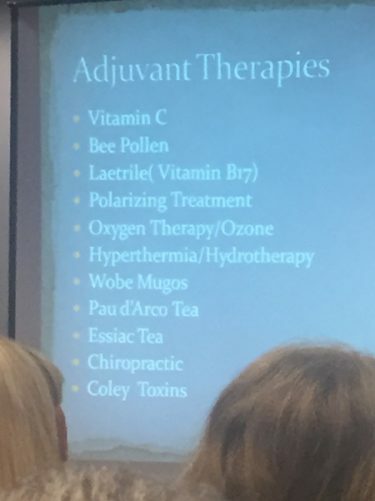 Topping off the programme is a range of pseudoscientific adjuvant therapies: ozone therapy, pancreatic enzymes, vitamin C megadosing, laetrile (derived from apricot kernels and containing cyanide), and hydrotherapeutic immersion in a mix of water and hydrogen peroxide (a.k.a. bleach). The Gerson regime is as extreme in its proscriptions as it is in its prescriptions: all sodium is strictly prohibited, as is all meat (Vickers: “If you eat meat on the Gerson diet, you will die”) and all forms of exercise (Vickers: “If you do any exercise on the Gerson diet, you won’t heal”). Most damning of all, Vickers explained that patients are encouraged not have any hospital scans for six months. 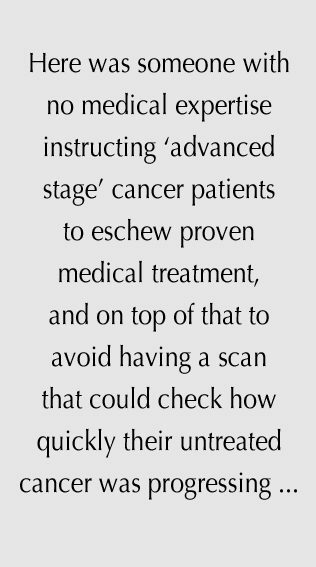 Here was someone with no medical expertise instructing ‘advanced stage’ cancer patients to eschew proven medical treatment, and on top of that to avoid having a scan that could check how quickly their untreated cancer was progressing. The danger to patients couldn’t be more starkly illustrated. Whenever we see a single treatment claimed to cure multiple diseases with entirely different pathologies, with nothing but the testimony of those promoting the therapy to back up those claims, scrutiny and skepticism are reasonable responses. When the treatment is promoted via scaremongering about modern life and modern medicine, scrutiny and skepticism become essential. Vickers was certainly not shy in outlining what he believed to be the dangers of modern living, decrying modern technology (“I can’t tell you how many cancers come in related to cellphone and computer use alone”), denouncing genetics (“The whole genetic theory [of cancer] is a fraud. The BRCA gene? They’re coming up with more and more genes – ‘it’s genetic’, ‘this disease is genetic’. It’s not, folks.”) and starkly warning about the perceived paucity of the modern diet (“Today, I can take a 55-year-old person, across the board, and they’re already showing signs of severe osteoporosis … their bodies are so depleted from five decades of eating horribly deficient foods”). Vickers: “You’ll be weaned off the medication”. Audience member with bone cancer: “I’m on Tamoxifen”. Vickers: “You’re going to have to get off that”. Vickers: “It’s incompatible with Gerson therapy… Do you know what chemotherapy is created from? It’s mustard gas, used in biological warfare, to kill people… Once they’ve done the chemotherapy and the radiation, it comes back ten times more aggressive than it was before they got the chemotherapy”. Vickers indicated with a hand gesture that he felt the patient’s condition would rapidly decline after a year. I have afforded the patient the respect of anonymity in this report; Vickers afforded no such courtesy when he told the story on stage. While listening to Vickers spread dangerous misinformation to a room filled with cancer patients was tough, tougher still was hearing the enthusiastic agreement of the audience. There was the lady who was distressed about whether she would still be able to do Gerson Therapy despite being unable to take a coffee enema due to the surgery to treat her bowel cancer (Vickers: ‘You can, once you’ve healed a little, but typically if you have a bag you don’t do well’). 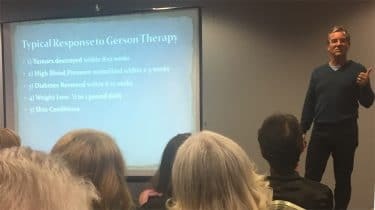 Then there was father who explained that he cured his son’s autism with Gerson Therapy, but wanted to know why he himself found holding in a coffee enema for the required fifteen minutes to be too uncomfortable to bear, while his son ‘could go as long as you liked’. It’s hard not to wonder whether the father was too invested in the ‘cure’ to countenance the possibility that his still-autistic son might struggle to articulate how uncomfortable and distressing he found the enema to be. And then there are perhaps the most heartbreaking cases of all: the cancer patients who have tried the Gerson Diet only to see their cancer continue to progress; those who are now adamant they understand what they did wrong and how they can follow the protocol better in future. You see, for even the most true-believer of Gerson practitioners, the complexity of the regime can be its own defence against the inconvenient truth of disease progression: as Vickers made clear during his lecture, “If you don’t go with the diet for even a single day, you won’t make it”. Or, to put it another way, if the disease continues to progress, it’s your own fault: it’s because you didn’t follow the rules, you didn’t stick to the programme, you did something wrong. The more complicated and uncomfortable the program, the bigger the risk that patients will slip up even once – thus the greater impetus to impress upon the sick and the dying the need to spend tens of thousands of pounds at expensive clinics to learn how to do the treatment “correctly”, and the greater scope for victim-blaming when the tragic inevitability comes to pass. This, sadly, is so often the reality of the wellness industry’s approach to a deadly disease: extreme promises backed by grand conspiracy, with no real accountability. From the outside, it is grim; when sat among the very people most at risk from the rhetoric, it is downright grotesque. ← Do Lawbots Dream of Electric Briefs?